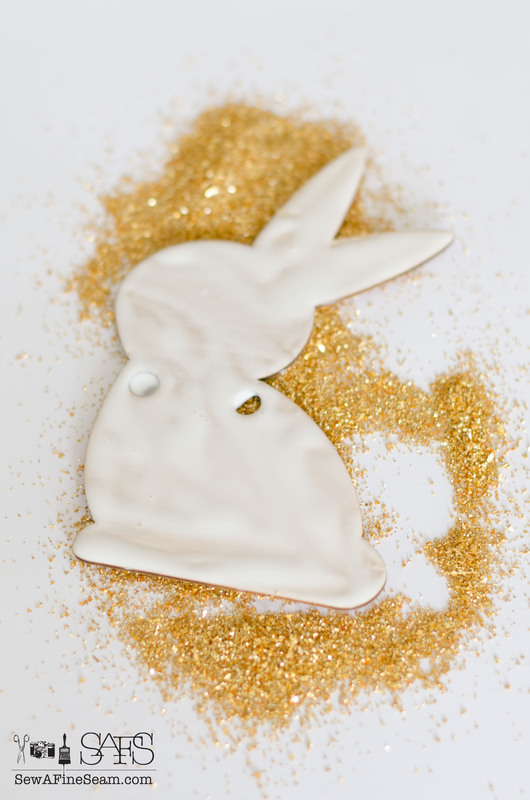 I’m excited to share this simple, but fun and bling-y little project with you. I love glitter – but not just any glitter. I love German Glass Glitter. You can find glass glitter for sale in my shop – it’s the real deal and I love it! This project is so simple and fun. You could do it with your kids, but if you have any under age 12 I woulnd’t suggest glass glitter. It really is GLASS and it can cut you if you are not careful. 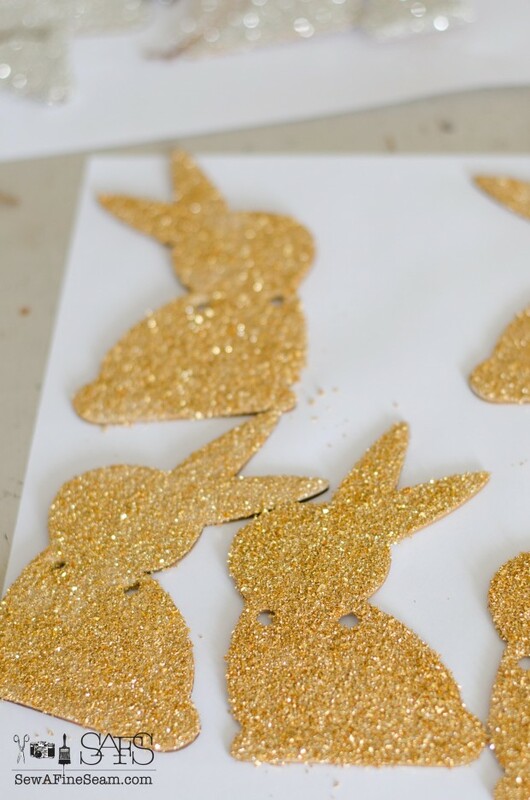 To do this with kids I’d suggest regular glitter from any craft store. 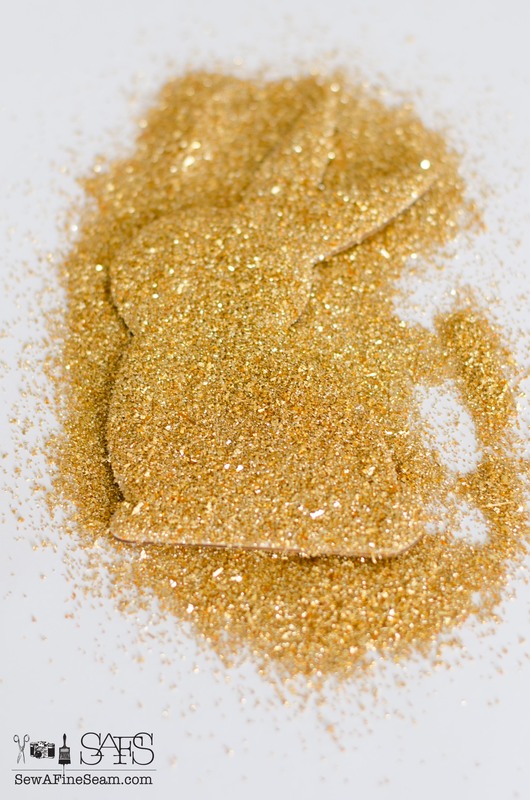 And for anyone using glass glitter – use caution! Don’t forget it is glass and do your utmost to keep it off the floor. Small pieces of glass in your foot will NOT feel pleasant! I found my wood bunnies at Target in the dollar section. I think each pack was actually $3 but there are a lot of bunnies in each pack. The large bunnies were on a hemp rope, creating a garland. 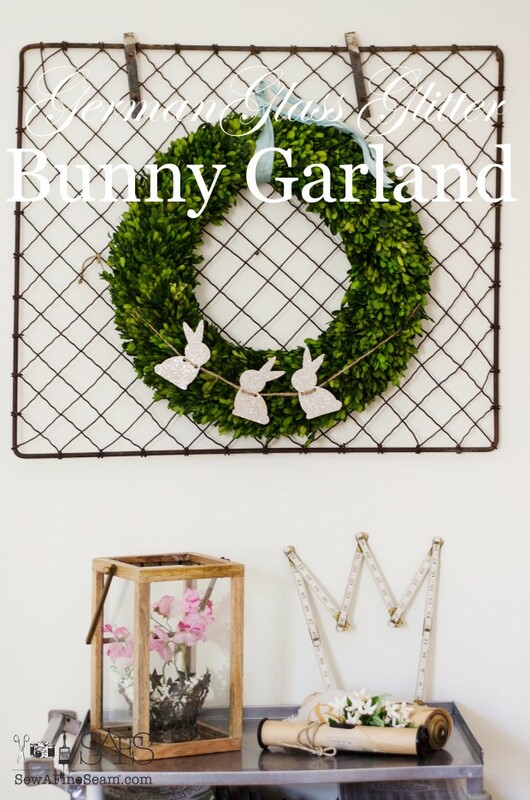 The small bunnies are individual with twine for hanging. I took the large bunnies off their rope for glittering, but left the twine on the small bunnies. I use plain old Elmer’s school glue for glittering and get along just fine. A cheap artist brush is ideal for spreading the glue. I like to pour some glue out on a paper plate or piece of cardstock. 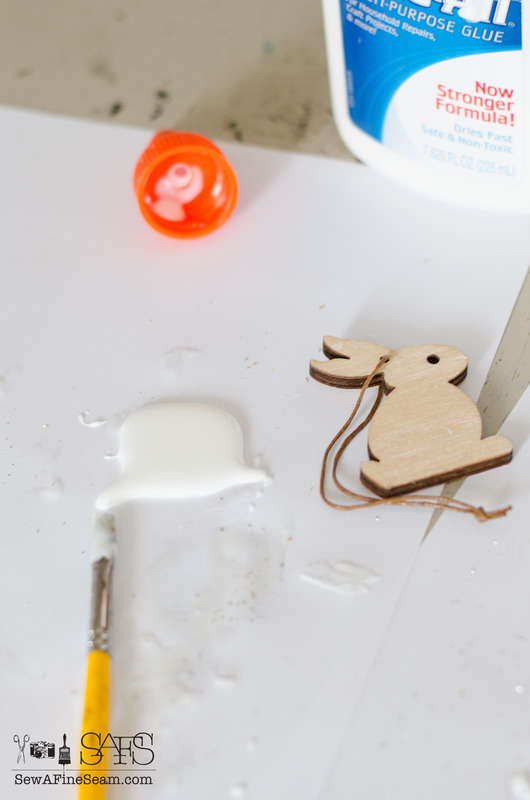 Makes it easy to ‘paint’ the glue onto your craft. 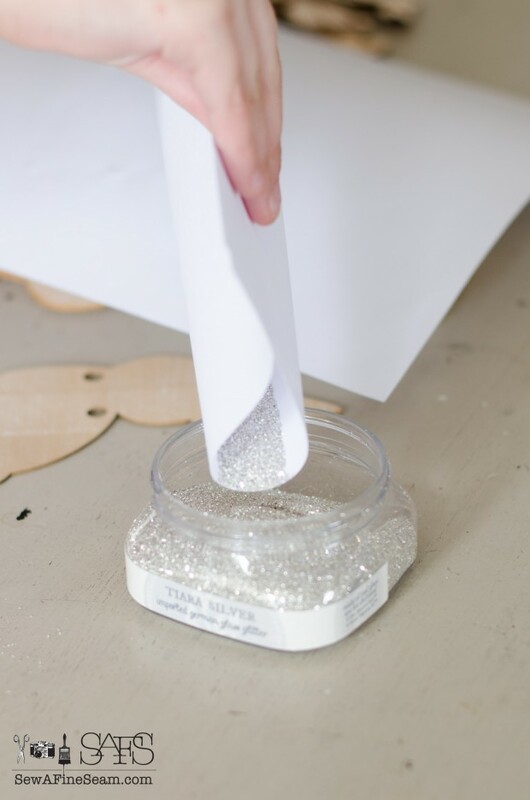 I always glitter on a piece of paper that is a good size to pick up and pour the glass glitter back into the jar. Use plenty of glitter – the extra will be poured back into the jar for the next project! Let glittered craft dry on a clean piece of paper till dry. I strung the large ones back on their rope and added them to my preserved boxwood wreath for a fun Spring/Easter accent. You could also string these on a fun colored ribbon for an extra Spring pop of color! This so sweet Jill! I love it! Thanks Lisa, it was super fun to create! I have had the glass glitter for ages and never take the time to use it for anything. Glad I finally did! I’ve been thinking about getting my glass glitter back out and doing some eggs. I love the glass glitter. It’s so fun! I’d just been wondering where to get it. I’ve had mine for a long time and it came from Andrea Singarella’s shop. Double hooray that you’re going to have it. This stuff is pretty cool – and when we asked if the silver tarnished like all the silver glitter we’ve used they didn’t know what we were talking about! Woo-Hoo! A silver glass glitter that stays silver! Those are sooo cute! I have some german glass glitter, I’m def going to do this! Thanks Susan! Have fun – these are so great to make!